In today’s guide we will cover everything you need to know about golf GPS watches and what you should look for when buying one. Golf GPS watches have become very popular in recent years as wearable technology has evolved. 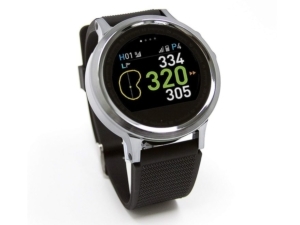 Today many smart phone watches can also pair as golf GPS devices when connected to golf apps. Let’s start off talking about the various features that come installed on a wearable golf GPS watch. Then we will get into questions about how they work, are they legal to use on the golf course, price expectations, and other important questions to answer. What to Look for When Buying a GPS Golf Watch? The following is a list of possible features your GPS golf watch could include but doesn’t guarantee a watch will have them. Keep in mind that the more expensive watches will usually carry more tech in them since they are usually built for professionals who want to monitor more advanced data than basic yardages. First and foremost, you want your GPS watch to display accurate distance yardages on the screen to assist you as if you had your own personal caddie. Your GPS watch should include distances to the front, back, and center of the green. It’s a bonus if it also includes yardages to hazards and doglegs. Additionally, more advanced GPS watches offer touch to target distance information allowing you to press a certain location on the screen and it will quickly calculate a distance to that point. This is helpful if you want to manually check distances to a layup zone or to a specific bunker you’re trying to avoid, for example. The track shot distance feature is a separate mode you can click into on your GPS watch and it will allow you to track the distance of that specific golf shot. For example, you’d click “begin” on the watch and then hit your tee shot. Then you’d drive to your golf ball and when you get up to it, you’d click “end” on the watch. It would then calculate the distance between your start and end point so you can learn how far you just hit your club. This is very helpful for learning your golf club distances overtime and making smarter choices on the course. In the old days you’d have to connect your golf watch to your computer and manually download lists of golf courses. But most golf watches today come pre-loaded with 30,000 to 45,000 golf courses from around the world. Some of these watches will automatically update as well when connected to wi-fi and others will auto-update on their own without needing wi-fi connectivity. 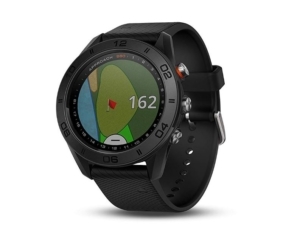 Most GPS golf watches have a feature called auto-course recognition where it uses GPS to locate which golf course you are playing and automatically pulls it up so you can start off your round without having to manually search the course on the device. The green mapping feature allows you to see the actual shape of the green. It’s very helpful especially in situations where you are far away from the green and want to see where you should be aiming. This feature will help you learn how wide the green is as well as the depth of the green so you increase your chance of landing the golf ball on the green by making smarter shot choices. Another cool feature to look for is the ability to manually set the pin’s location on the green and the watch will then calculate the distance, so you get even more accurate information in addition to the usual front, back, and center yardages. Having a waterproof GPS golf watch is a bonus for days when it rains, accidental drops into water, or excessive sweating from hot weather during the golf round. This feature could offer tools built into the watch that track swing path, swing speed, launch angle, ball speed, and other swing metrics so you can learn your swing faults and make adjustments to your swing over time. Instead of logging your scores on an app or on the paper scorecard which could get lost, you may have access to a digital scorecard feature on the golf watch itself. This allows you to track and store your golf scores for review later on. It also let’s you analyze your performance over many golf rounds so you can see tendencies and improvement progress. Battery life is another feature to consider heavily as you want a golf watch that can last you the entire 18 holes. It’s also a plus if the battery life is long enough to last multiple rounds so you don’t have to constantly charge it after every round. Most golf watches have battery life in the range of 10 hours to 18 hours but make sure to check. Touch screen is an important feature for making the GPS watch easier to navigate allowing you to click in and out of different pages on the watch. The alternative is using the buttons on the outer edges of the watch to navigate different pages if it doesn’t have touch screen as a feature. Golf watches can get quite techie with the many features they have installed, and this can be very confusing for the average user trying to navigate around finding where each feature is and how to work it. 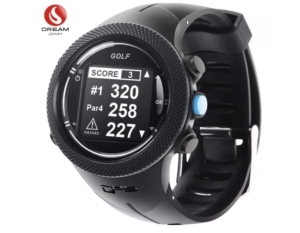 You’ll want to decide based on personal preference if you want a basic golf watch that’s easy for the amateur player to use or if you want the more advanced, high-tech golf GPS watch. Another cool bonus to having a golf GPS watch is when it doubles as an activity watch as well. You should find basic features like tracking your daily steps, calories burned, and miles walked. Sometimes you can get more detailed fitness activity as well in addition to these basics. Depending on which golf watch you purchase, it may have additional features that come included on an app. This can give you access to even more data, tools, and helpful resources to improve your golf game. 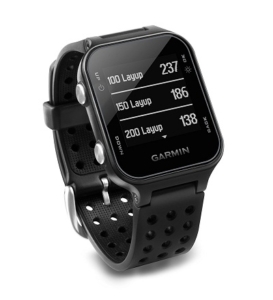 For example, Garmin Connect is the app you get access to with most Garmin Golf GPS watches and it allows for extra features like fitness activity data, golf swing data, scorecard analysis, and access to an online forum community where you can interact with others on the platform (similar to a social media site). A typical GPS system has the ability to track your exact location through technology which usually comes pre-installed in your car, your phone, or in this case your GPS golf watch. According to Golf GPS Authority, GPS was advanced technology first used by the military but has since been opened up to the public. How it works is there are many GPS satellites orbiting around earth and the GPS golf watch is designed to pin your exact location by sending off signals that get picked up by the GPS satellites to locate you on the golf course. Data is transferred back to the GPS watch and recalculated to show your exact location on a given hole. Then you get to tell the watch where you want to hit the ball by tapping a location on the screen and it quickly calculates a distance to that point. Not every golf GPS watch has this touch to point distance feature, but they will auto calculate yardages to the green with most watches offering 3 distances; back, front, and center of the green. Some watches also give distances to hazards and doglegs. Are GPS Watches Legal in Golf? GPS watches fall under the rangefinder devices category which also includes handheld GPS devices and rangefinders. For a long time, rangefinder devices were outlawed in tournament play and could only be used in practice rounds and non-competitive rounds. However, with advancement in technology and a shifting culture, golf rules officials have become more lenient and do allow GPS watches to be used in certain situations of competitive tournament play. Right now, it is up to the local golf club or tournament host to decide whether they are allowed or not. For example, junior golf and high school golf tournaments have started allowing golf GPS devices to be used. College golf which is regulated through the NCAA has allowed limited use of range finders and GPS watches. The rangefinders and GPS watches that are being allowed for competitive play are usually the most basic ones that only have distance measuring abilities. You’re allowed basic information like distance to the center, front, and back of the greens. Therefore, picking out a GPS watch that you plan to use in competitive tournaments should be carefully inspected to make sure it complies with the types allowed by the USGA, NCAA, or other ruling government body. 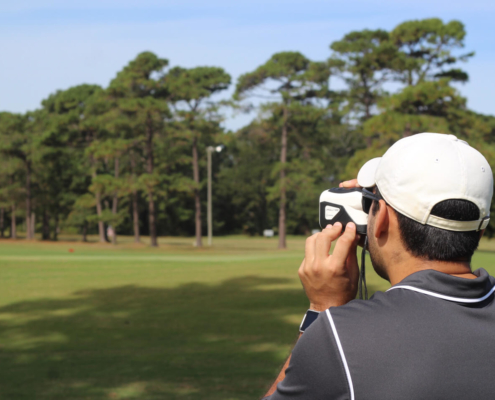 Do PGA caddies use rangefinders? The PGA is another league of its own which is why we did not discuss it in the previous section. Currently, the PGA does not allow rangefinders and distance measuring devices to be used during PGA Tournament rounds of golf on Thursday through Sunday. However, during practice rounds it’s common for players and caddies to use their rangefinders and GPS watches to study the golf course and prepare for tournament play in the upcoming days. According to Golf Week, the USGA has Rule 14-3b which bans “artificial” devices used for “gauging or measuring distance” or other conditions of play, such as the course’s slope or the day’s weather. The penalty for violation of Rule 14-3b is disqualification. Until this rule is changed, the PGA players and caddies will continue to NOT be allowed to use rangefinder devices during tournament play. Why Are Yardage Books Allowed on the PGA Tour? You may notice players pulling out yardage books quite frequently before hitting their golf shots. This is especially common on the putting greens with players like Bryson Dechambeau running all kinds of calculations with the aid of a putting book. Yardage books are not considered “artificial” under rule 14-3b and are therefore permitted during play. However, in 2018 the USGA ran a feedback period and decided to make some changes regarding use of the green reading books. You can see the full details of the new restrictions on green reading books from this Golf Channel article. How Much Do GPS Golf Watches Cost? Now that we’ve discussed many features you’ll find on a GPS golf watch, you’re probably wondering how much it’s going to cost you if you choose a more advanced golf watch as opposed to a basic watch with limited features. The short answer is that price will vary. You’ll want to compare features among watches within a particular brand (Garmin, Bushnell, SkyCaddie) but also compare watch brands to each other. 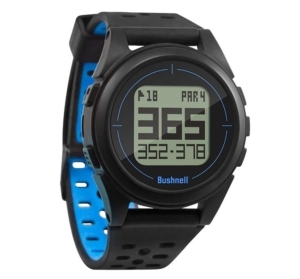 You may find a feature packed golf GPS watch at an affordable price if that’s your goal. To give you a range, however, there are affordable GPS golf watches under $100 as well as more expensive watches that cost above $300. Should You Buy a GPS Golf Watch? Today we covered the various features to look for when shopping for a golf GPS watch. It should of course include basic distance tracking to help you learn approximate yardages to the green and hazards but it’s also beneficial if you can track individual shots as well as touch individual locations on the watch to get distances. We’ve also reviewed the rules regarding GPS watches. You are allowed to use them for fun on your own during practice rounds and weekend play with friends. For tournaments, you’ll want to contact the golf course and ruling government body who monitors the tournament to ensure the GPS watch is allowed or complies with rules they have set. 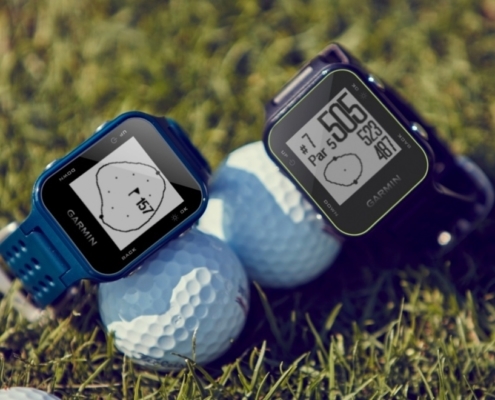 Overall, it’s a smart decision to buy a GPS golf watch if you think the distance information will help you make smarter club selections on the golf course. All the additional features can also help you learn more about your swing and your tendencies to help you find ways to make improvements.